Controladores de conductividad Toroidal - ChlorKing, Inc. Maintaining and controlling salt levels in your saline pool is one of the most critical functions to ensure that your system operates as designed. Low salt levels will cause a number of problems for your system including shorter lifespan on the cells and lower chlorine production. The ChlorKing®5000 toroidal conductivity controller gives you peace of mind that your salt levels are correct without having to manually test the water. A clear digital display shows the actual ppm of salt in the water and the current temperature of the water. By adding a ChlorKing® saturated salt feeder and pump you can now totally automate the additional of salt into your pool as well. 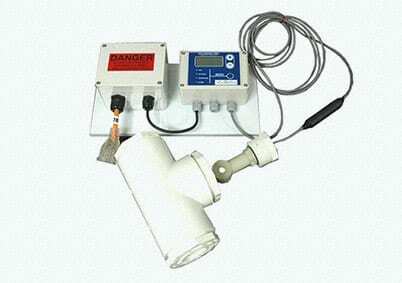 Tired of carrying heavy salt bags to the pool and manually adding to the water, our automatic salt feeders will monitor and maintain the salt in your pool at the pre-set level you desire. ChlorKing® also features toroidal conductivity sensor controllers to monitor and dilute your pool water when the toroidal conductivity sensor reaches a preset level. This unique controller has the ability to add fresh water to the pool and reduce toroidal conductivity sensor levels when desired, or at a user selected level. 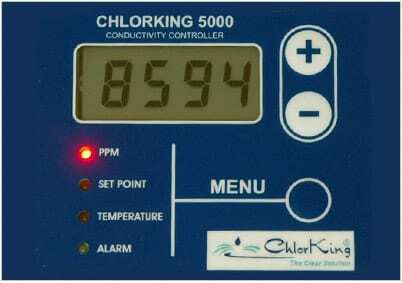 Toroidal control by ChlorKing®, another advantage and the clear choice for your pool and spa. Contact us today for more information and ordering.